Canadian's Best Pay Per Click Management Services. Get a free quote today! Hosted in Canada Managed Pay Per Click (PPC) solutions can help give your site traffic a boost with through strategic paid search campaigns - and we'll do the heavy lifting.We'll get you set up in a snap, assist with selecting common keywords and phrases create ads and measure performance to maximize ROI. Our campaign strategies are designed to meet the needs of our clients and their market condition. 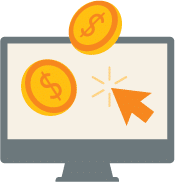 We provide up-to-date, Pay Per Click services that include: Paid Search Ads, Video Advertising, Display Ads, PPC & Remarketing and Social Advertising. Google AdWords can help you connect with people searching online for what your business offers by showing your ad in search results. Give us a call and we’ll talk you through the basics of AdWords. Looking for a custom quote? Tell us about your project! Let us help you get your business online and grow it with passion.